A writing quota for books, stories, or articles that you will write. Set a reasonable expectation. Marketing goals might include trying out new ideas, learning new strategies, or devoting more time to this task. If you feel like you worked too hard in 2013, you might want to devote more time to family and find a better balance between writing, marketing, and family time. You might want to devote more time to writing if marketing or other activities are cutting into your writing time. The new year might be a good time to try out a new writing style or genre, or to develop some new characters. Making an effort to get traditionally published, or switching over to self-publishing, are possible goals. You might join a writer’s forum or book club, attend a conference, or get involved with a writing-related group. A new year is always another opportunity to stay positive and deal with stress better. Common resolutions, like exercising more and eating write, are valuable for writers, too, especially as we spend much time sitting at a desk. Perhaps you’d like to read more books in 2014. 1. To remember to eat while engrossed in my own writing. 2. Fine tune my morning routine, so I can get to writing before noon. 3. Continue on my ultimate goal of having a Ben & Jerry’s Flavor named after me, Windemere, or one of my characters. “Fizzle” made with Pop Rocks candy. My kids loved that stuff and poured it onto their ice cream. Like Nerds, only it fizzed and popped in your mouth 🙂 I wonder if it would spend it’s pop on the ice cream though, instead of your mouth? Forgot the name of it, but there was a Baskin Robbins flavor that came out in 1999 for July 4th. It had Pop Rocks in it. Think it had raspberry swirled in too. To join a writer’s group for sure or take a class to help refresh my skills. Try guest blogging and getting my blog further along. Mostly? Just finishing my rough draft. Thanks, Chris. If you see me creeping through your posts its cause I’m making a plan. Thanks for all your advice postings. They are some of my favorites. I resolve to do more reading of other authors’ works–especially if they are indies. fantastic resolution suggestions. Thanks! I feel they are all wonderful because they are concrete, realistic, and they depend on the WRITER alone, not on other people (in the way, say, resolving to land a agent depends on an agent agreeing to take you on). Definitely more time writing this year, which means scaling back on post lengths or numbers. There is so much time required for research, so there will be more time in the libraries and online bookstores. Also have to get my paperbacks onto shelves in town this year…not a long term resolution, but a short term goal. I’m going to ramp up my writing using Dickens as my model! Chapters, series, blog posts, second novel, articles! Feeling optimistic. Happy new year to you! Sounds like the best of times and the worst of times. 🙂 A year filled with writing would be worth looking forward to; good luck with your goal. 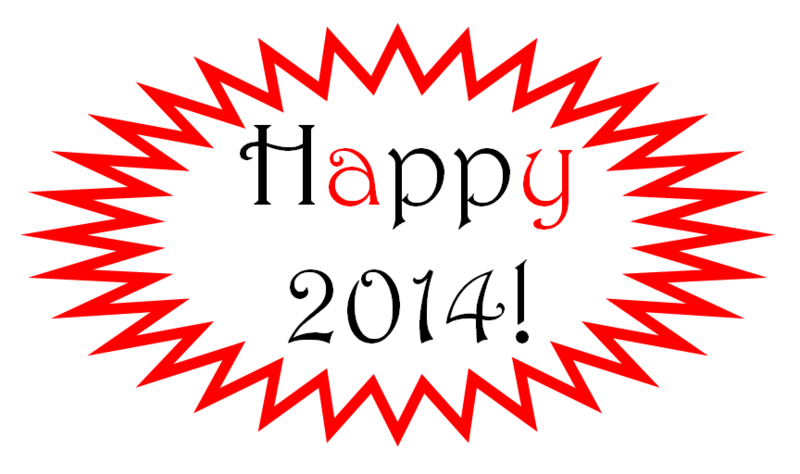 Happy 2014. Happy New Year to you Chris. Thanks for these tips.